VJzoo are projection artists from Australia. We love antique stained glass, and it projects beautifully. This website will be for our projects featuring stained glass. 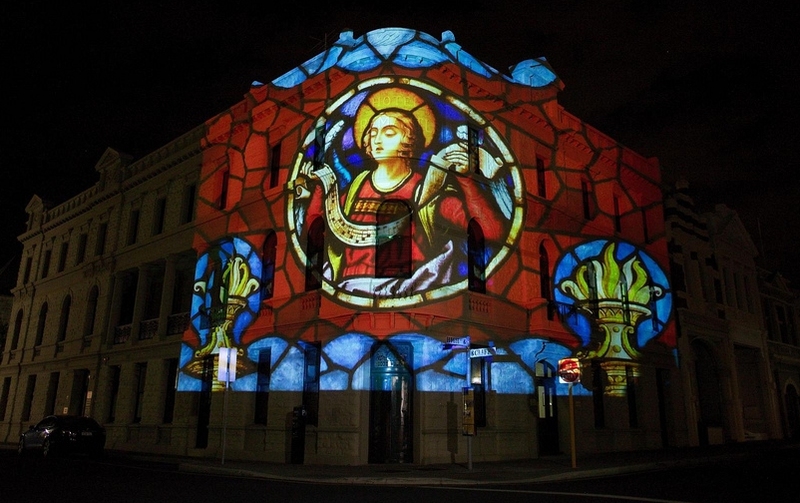 We've done a few stained-glass style projections already as part of other events such as Projections on High, but we have an event coming this December completely based on antique stained glass. Sites are in carparks just off Rokeby Road and Hay St, see the map of sites. You can also download an Information Sheet that tells you a little about the sources for each site. These projections are being developed by VJzoo for the City of Subiaco, with kind assistance from schools, businesses and the local community. Artist Jenna Downing will be live-drawing in stained-glass style.